New glass goes a long way in modernizing your bathroom or spa. Transform them with new, beautifully constructed, shower doors. 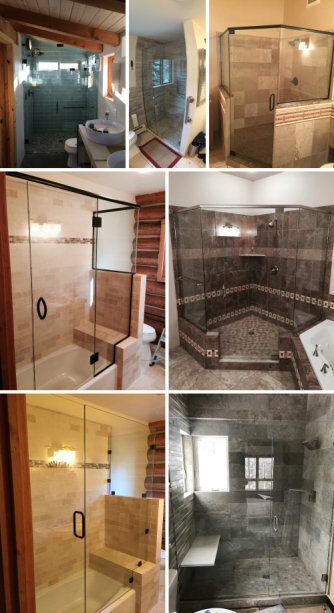 With custom designs and accents, Integrity Glass will help you select the best shower enclosure for your home. You’ll be blown away by the phenomenal quality, provided at a fraction of the cost of the competition! Integrity Glass is an official Milgard dealer, meaning you can count on a lifetime of quality. Milgard glass windows and doors provide energy-efficient and draft-free solutions that match your home’s aesthetic. Integrity’s team will help you select the best fit for your budget and energy needs. Replace those drafty, inefficient, or fogged-up windows! Using modern installation methods, Integrity Glass can install new windows without damaging existing stucco. Besides providing a superior product, Milgard facilitates excellent service. Any repairs, replacements, or re-seals are covered (labor and all) for as long as you own your home, fulfilled by Integrity Glass. Making a great impression for your business starts with the storefront. Your glass windows and doors help to beckon customers inside, so make sure you’re putting your best foot forward. Integrity’s professional staff can complete any commercial glass job for storefronts, office buildings, apartment, and condos. And while it’s important, commercial glass is about more than presentation. Safety is paramount when considering your business and the people coming through it. Integrity offers tempered, safety, and fire-rated glass for commercial projects. Chipped, cracked, or broken, Integrity Glass offers next day service on the installation or repair of automotive glass of all types. Windshields, windows, headlights, mirrors and more are serviced quickly and conveniently. As with everything Integrity does, automotive glass services come with the best possible product at the best price around!